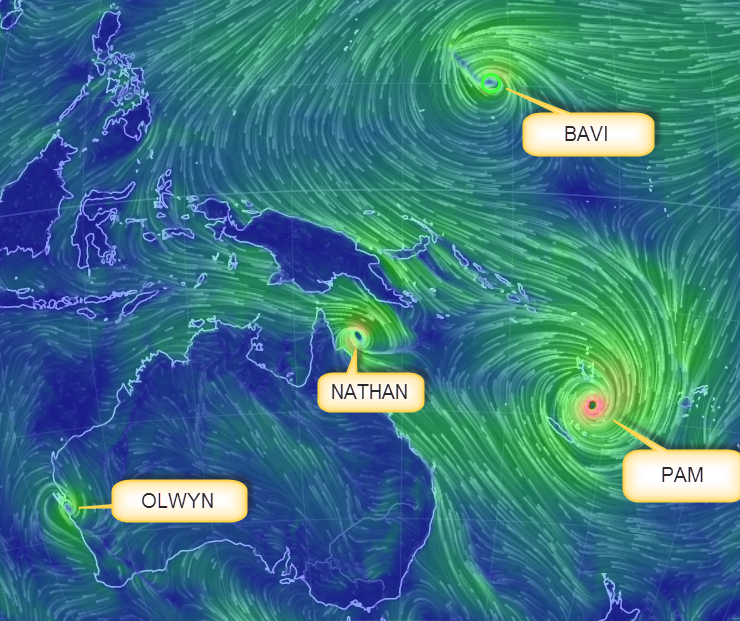 There's a lot happening right now in regard to tropical storms and cyclones. It's Pam that's causing most consternation. In Fiji, head of the United Nations Office for the Coordination of Humanitarian Affairs for the Pacific, Sune Gudnitz, said the storm was the "worst-case scenario". "The most vulnerable will certainly be the people that are living or residing closer to the coastline, which in a place like Vanuatu is a lot of people," he said. "Very few structures I think will be able to withstand a category five cyclone of the magnitude that we are seeing. "So we are looking at potentially total destruction of many shelters, residences, especially in the islands south and outside of Port Vila." Vanuatu's northern islands were the first to feel the destructive force of Pam, the strongest storm to hit the nation of 270,000 people in nearly 30 years. Our thoughts are with all the people in its path. Stay safe. 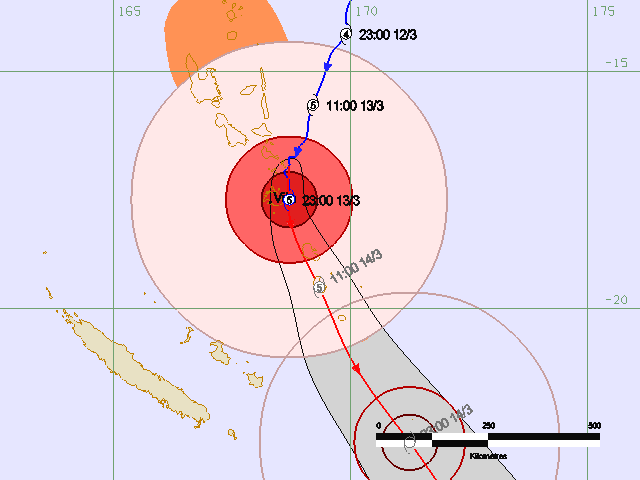 If it keep drifting westward New Caledonia may be adversely affected. I should have refreshed the webpage. 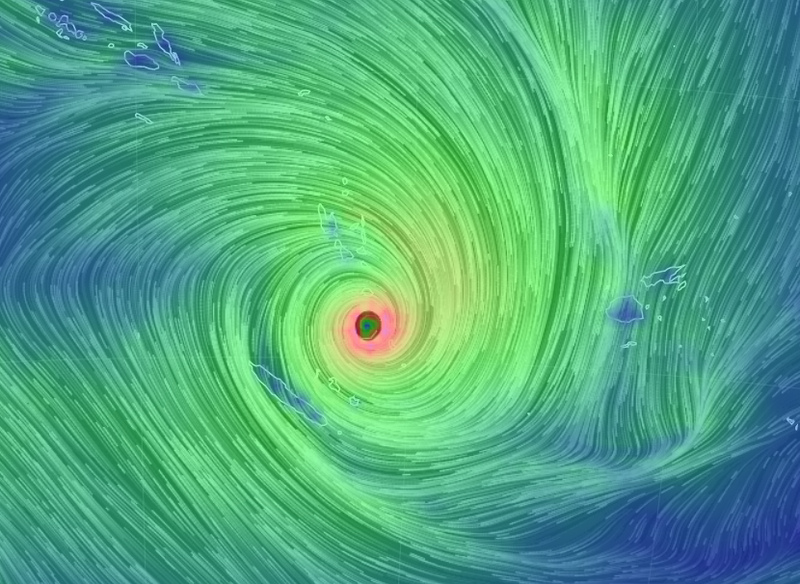 Cyclone Pam has weakened to a Cat 4 and has resumed it's south-easterly track towards New Zealand. "Weakened" to a cat 4, yikes. Measurements vary (the Japanese have her relatively weaker), but if the local observations are correct, Pam reached 250 km/h for 10-minute sustained winds, making her 45 km/h stronger than Marcia at her peak. Put it another way, although her 1-minute sustained winds were considerably lower, this 10-minute sustained measurement suggests Pam was stronger than Typhoon Haiyan...Hell's teeth! I said it 11 months ago and I'll say it again, it would be very interesting to see an analysis of storm by integral of expended energy rather than by peak wind speed. I think that there is a big story there. The index is calculated by taking the (mean?) sustained wind speed at 6-hour intervals and applying a squaring formula. There is no accounting for the size of the storm, in terms of actual mass of air involved, or of total water/humidity content which may affect the overall energy dynamics. In addition, 6 hour intervals would produce a relatively coarse resolution of the energy trajectory of the storm. Further, the occurence of the intervals is local time dependendent, and not fixed with reference to an estimation of a formation point of the storm. However the likely error that would result is probably small compared to the other issues. These are the main reason why overall I am curious about an integral of storm energy - something that captures all energy expenditure over space and time. That's where the real story would (or would not...) be. To add to my previous reply, whilst 'accumulated cyclone energy' may be proportional to the actual integrated expended energy there is no reason why it should always be so, or that any proportionality is simple. Bernard, ACE is only one of several indices used to measure total storm energy. There is the Power Dissipation Index (which reduces the bias in ACE towards moderate but long lived storms), the Hurricane Severity Index (which accounts for the size of the wind field as well as its strength). There is even the special Index (wrongly called ACE) that props up claims of no change in tropical storm frequency - it is ACE, but with an arbitrary floor value, allowing the author to cherry pick the data to bolster his case. I agree that some of these metrics are crude, but you work with what you have - expecting finer temporal or spatial resolution, which would be needed for a substantial improvement, is optimistic at best. OK, I see what you mean now. Thanks. Frank, I did subsequently come across the HSI. It's closer to what I am thinking about, although not quite there - as you say though, one takes what one can get. The HSI approach doesn't seem to have been applied much beyond the Atlantic context, which would seem to further limit its utility. I'll continue to hope for an integral approach that can be applied to all storms across the planet, in a way that provides a direct indication of energy expenditure - perhaps one day that wish will be granted! On a scientific (and hence irrelevant in the here and now) tangent ... Between them these storms are packing an almighty westerly wind burst in the equatorial Pacific. Presumably this could kick ENSO into high gear by providing the necessary atmospheric coupling to the huge sub-surface signature already in place in the ocean. What does Michael Zimmerman mean - "even if"?